InVogueJewelry: Is Silverite "Madagascar Sapphire"? Any Sapphire? NO!! Is Silverite "Madagascar Sapphire"? Any Sapphire? NO!! I've written about a stone that is found almost exclusively on Etsy that is called "Silverite". I did a lot of research on this stone, contacted the GIA (Gemological Institute of America---the only real and reliable source of gemstone information and certification) and their response was: they know nothing of this so-called gemstone. They never even HEARD of it! If you'd like to read my original post, it's here. The main wholesale seller of this Silverite stone (in briolettes, rondelles, various colors, etc.) is from India and also has a store on Etsy. I wrote to them and asked what this stone is exactly, and their response (which you can read in my post linked above) was basically that Silverite is a "new gemstone" and is not coated in any way, and they've sold it almost exclusively to Etsy sellers. 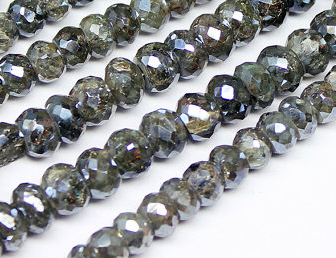 If Silverite is a "new" and uncoated gemstone, then why are Etsy sellers (who obviously bought it from this importer) marketing this as coated diamonds, diamond coated stones, sapphires, pearlescent coated gems, opalescent coated gems, and even mystic quartz? As I said before, there is only one answer and that is, "creative marketing" -- to deceive the public into buying something from their shop. Now I see it's being sold on Etsy as "Madagascar Sapphire." This stone is NOT sapphire. It's not from Madagascar. It's not a coated sapphire. It's not any form of corundum. To call it "Madagascar Sapphire" is totally fraudulent, because NO wholesaler is selling it as sapphire, because it is not. As I said, I personally contacted the GIA as well as the wholesale seller of these stones. GIA hasn't heard of it. The wholesaler in India SAYS it's just simply Silverite, a "new" and uncoated stone. And IF these were sapphires, believe me---the wholesaler would be selling these as sapphires, not a "new stone" which costs maybe $25 a strand. In Madagascar, where rich deposits of sapphires were discovered just a decade ago, a Wild West economic situation has led to dangerous working conditions and a highly unregulated industry. Allegations of child labor and abuse have also marred the gemstone trade in Madagascar. Children have been used for their small size and agility, often required to climb into small holes in extremely dangerous situations to see if gemstones are present. Illegal mining activities are commonplace, often found in locations with poor safety standards. Little to no access to health care services exacerbates dangerous working conditions in sapphire mines. Injuries are common, caused by dangerous conditions including falling shards and rocks, collapsing pits, and underground fires, which can cause smoke inhalation." So why would anyone want to claim their stones are from Madagascar, which would mean these have been unethically mined? Not to mention that they aren't sapphires anyway! My guess is they think that calling them "Madagascar" Sapphires makes the stones sound more exotic, more dazzling, more desirable. They are preying on the ignorance of potential buyers. Whatever Silverite is chemically, it most definitely is NOT sapphire, no matter how many times sellers keep saying that. Please, do your own research and know what you're buying!! Knowledge is power, and ignorance just plays into the hands of these manipulative sellers. Thank you for posting, Dawn! What Is A "Synthetic" Gemstone? Gem Silica - What Is It?